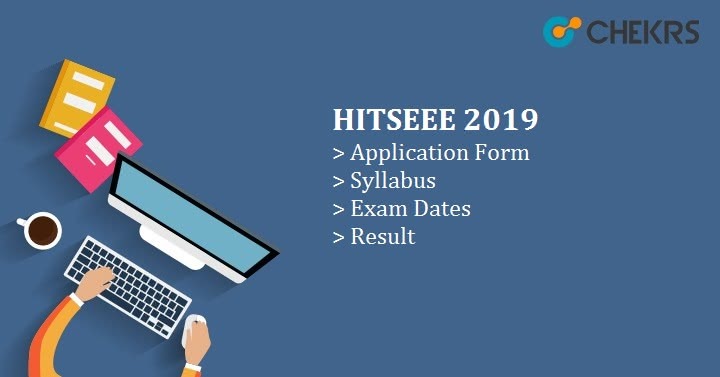 HITSEEE 2019: The HITSEEE Exam is the norm of HITS i.e Hindustan Institute of Technology and Science. HITSEEE is the abbreviated term extracted from the Hindustan Institute of Technology and Science Engineering Entrance Examination. To reserve a seat in the choicest academic course of the prestigious deemed university, it is mandated for willing aspirants to go through this phase. The HITSEE is the online examination regulated by the university for Hindustan University Admission 2019 in UG technical courses. If you want to know more information to stay aligned in the Hindustan University Admission Procedure for the engineering courses; from here catch up all essential details such as admission criteria, application form, Hindustan University Application, important dates, exam pattern, syllabus and other post examination process, then read out the complete article. When applicants are looking forward to starting their higher studies, it is important to learn that the academic schedules are different there. Likewise, the admission process and its events have a different schedule, however important to us. Through the table, make it easy to check the HITSEEE 2019 Important Dates from the table. The university grants permit admission in the university only when the exam is qualified. However, this isn’t all as students also need to fulfill certain criteria in order to appear for the Hindustan University Entrance Exam. The HITSEEE Eligibility to appear in the test. Here we are listing down the essential requirements of the university. Age limit: The applicant should be 19 years old. A minimum aggregate of 50% marks in Maths, Physics, & Chemistry in 10+2. The students who are interested in pursuing the 4-year B.Tech/ B.Arch academic course commencing 2019 onwards will have to fill Hindustan University Application Form on time first. The candidates willing to know what dates they need to follow can check out HITSEEE Application Form Last Date through the updates provided by us. Here is the HITSEEE 2019 Online Application process for all to be followed easily. On the website’s home page you will find HITSEEE Admission 2019 link. Open the link to proceed further. “Apply Now” option will be available on the top. Available next to undergraduate courses, click on the Apply now link again. The registration page will open up. Enter valid details in the right field and click on register. Upload the required documents, true to your knowledge. For any student who will be applying for admission to the university for the first time, knowledge of exam pattern play a major role. All of the university level exams have their own pattern, thus here. It is crucial for one to be familiar with Hindustan University Entrance Exam Pattern to avoid poor performance during the exam. Here we are providing the brief of the exam pattern so to make the process manageable for you. Nothing can predict the real outcome of an exam. But if you prepare enough, it determines your confidence to appear in the exam and eventually scoring more. We are sharing a few tips through which students can improve their performance. Manage your schedule by managing time appropriately giving time for difficult and easy sections/subjects. To perform better, increase your practice to solve more and more questions by solving mock tests and previous papers. Try not to trick yourself by skipping NCERT books and ignoring basic syllabus. As the exam is taken in the online method, knowledge of exam center is more crucial. Candidates can obtain the information related to their exam, its schedule and more through the admit cards. The HITSEEE Hall Tickets 2019 will be available on the university website which can be downloaded easily through Admit cards will prove to be helpful for all those who are looking to share. Through the direct link provided by us, it will be easy to download their HITSEEE 2019 Admit Card without any delay and hassle. The university doesn’t specify any criteria for admission in the university. Well, the selection is done on the basis of ranks. Post to result announcement, the marks are also formatted in the ranking system. Better and higher ranks from each category will be called for counselling. The Hindustan University Entrance Exam Results will be released in the month of May. We will give updates so that you can hear the good news of your selection earliest.